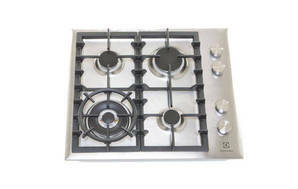 Snapshot: The Electrolux EHG643SA gas cooktop has 4 burners and flame-failure protection. How well does it cook? Very good results in our rice test. Excellent results in our white sauce and stir-fry tests. Very good burner layout (there’s a wok and simmer burner at the front). Comes with a wok trivet. Only three pots fit comfortably at once. Just OK stability for a small pan or coffee pot (need to use a small trivet). This tests the cooktop’s ability to perform at a low temperature for a long time. This tests the “turndown” capacity of the element (starting on a high heat and reducing to a simmer) and whether it can maintain a suitable heat at the lowest temperature setting. This tests whether the cooktop can deliver continuous high heat. Ease of use (40%): Rates the ease of using the controls, ease of cleaning, and the user-friendliness of the cooktop layout. Price is based on an August 2017 survey.